This is my reworking of the medieval price list at Medieval Prices into a form easy to use in RPGs, particularly D&D-likes. I’ve based it on a silver economy, since I like gold to be rare enough that a chest of gold is a fabulous treasure, not a couple month’s living expenses. You can change it back to standard D&D just by reading the numbers as gold and cp as silver. These prices represent approximately 1/4 the prices listed in the reference, since they’re calculated in four-pence pieces to make them large enough for carrying, and in some cases adjusted slightly to better fit existing RPG price lists or to give prices for some common things adventurers want to buy that weren’t on the list. Except where noted, prices in this list are given in silver pennies about 24mm diameter (1/60 of a pound), roughly the size of a quarter. The most common gold coin is worth 10 silver pennies, and weighs about 3.5 grams (about the size of a $5 American gold eagle, 1/10th of an ounce), roughly the size of a dime. A gold coin about the size of a quarter would weigh (and be worth) five times as much, or near enough for RPG work. This conveniently puts an ounce of gold as being worth 100 silver pieces. A copper farthing (where used) is worth 1/20 an SP would have weighed about six pennyweights, and been the size of an old Australian or British penny (31mm diameter). expensive materials, fine workmanship, and so forth. To get a hit location without needing another roll, look at the least significant digit of the damage rolled and whether the to-hit roll was even or odd. E.g. 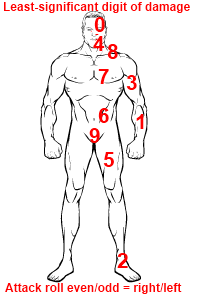 damage 3 would be the upper right arm if the attack roll was even, upper left arm if odd; damage 12 would be right foot if even, left foot if odd. The numbers are arranged so the heavier damage tends to be the result of hits in more vulnerable spots, while still allowing the full range of ordinary weapon damages (1d4 to 1d12) to fall almost anywhere on the body. One trick to using this fluidly is to interpret the results of smaller die sizes as covering larger areas, so a 3 on a d4 might be anywhere on the arm or even mid-torso, while a 3 on a d12 is specifically the upper arm. As I use it this is purely informational to help describe the result, though I might make an ad hoc ruling if it seems particularly relevant, such as requiring a saving throw to keep holding on if they’re clinging to a rope when they get hit in the arm. (This is a re-post of the chart that originally appeared in the post on Death & Dismemberment for 5e, since I think there are folks who skipped it since they’re not interested in D&d 5e content).